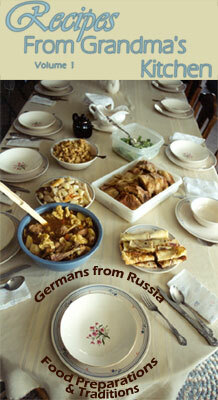 If four or more cookbooks are ordered at the same time, the popular 2002 videotape, Recipes from Grandma's Kitchen: Food Traditions of the Germans from Russia, videotape is available free of charge. The videotape includes a recipe booklet from the kitchens of the women featured in the program. To receive the free Recipes from Grandma's Kitchen videotape, the order can include any combination of cookbooks at the "Cookbooks" section of the Germans from Russia Heritage Collection website. Be sure to identify that you would like the free videotape with your order. Funding for the documentary videotape provided by Germans from Russia Cultural Preservation Foundation (www.grculture.org) and the North Dakota State University Libraries, Fargo, North Dakota, produced by Roadshow Productions, copyright 2002, 45 minutes. Traditional foods, savory recipes, and folk memories are important in the history and culture of the Germans from Russia community. "Recipes from Grandma's Kitchen" provides step-by-step detailed cooking and ingredients. There are vignettes of culinary memories that feed the soul and warm the heart. This limited-edition videotape is available to those who order their request from the GRHC website. Future videotapes are planned for the "Grandma's Kitchen" series. Becker, Bernelda Bernie. "Review of Recipes From Grandma's Kitchen." North Star Chapter Newsletter 28, no. 2: 5, March 2003. Kammerdiener, Faith. "Making German Kuchen." Owatonna People's Press, 2 December 2001.